Hardwood floors are great to have in more ways than one. Not only do they look great in just about any home, but they will also increase the value of your home. When a hardwood floor is kept in good shape, it can make your home look a lot classier and elegant. However, keeping up with cleaning the hardwood floor can seem like a big chore at times. Depending on whether you have a lighter or darker colored floor, you can see dust and debris pretty easily. Hardwood floors don’t hide dust as well as carpet does, so you will likely need to clean more frequently when you have them. Cleaning hardwood floors can be a daunting task if you don’t have the equipment to make your cleaning efficient. Getting out a broom and dustpan every day or week can be annoying after a few weeks. You also have to be careful when mopping hardwood floors, because water can damage some of them. What you need to invest in is a good hardwood floor vacuum. Not only will a hardwood floor vacuum save you time, but it will also protect your floor more. It can be hard not to scratch your floor when cleaning, so that is something to look for in a hardwood floor vacuum, among other features. When shopping for a hardwood floor vacuum, you want to make sure that you have the ability to turn on and off the brush. Some brushes can scratch your floor if the bristles aren’t very fine, so you want to be sure that they are delicate enough for a hardwood floor. The on-off switch is convenient if you will be vacuuming carpeted areas or rugs as well, so you can use one vacuum for each of those surfaces. Think of a hardwood floor vacuum the same way you would think of a regular vacuum cleaner, except it’s lighter and easier to work with. Most hardwood floor vacuums have just as strong of suction as regular vacuum cleaners, but you can adjust them to make sure they are safe for the hardwood floor. 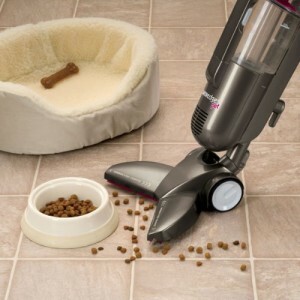 Many hardwood floor vacuums will also give you the ability to adjust the height of the vacuum. So if you have an area with tougher dirt, you can adjust the setting lower to the ground. On the other hand, if you just have some light dust that you want to pick up, then you can set it higher from the ground and it will be just as effective. Believe it or not, this is one of the major selling points or breaking points when people are looking to purchase a hardwood floor vacuum. There are advantages and disadvantages of both cordless and corded versions of vacuums. Corded vacuums are good because they are generally lighter and more powerful. You also don’t have to worry about a battery dying out on you, so you can vacuum as long as you need to. However, you can only vacuum as long as the cord will allow you to go. You will either have to get out an extension cord or switch outlets frequently if you have a large area to vacuum. Cordless vacuums are nice because you don’t have to switch outlets to get a job done. However, batteries in most hardwood floor vacuums will only last up to about a half hour on one charge, so you may have to have a backup battery if you use it longer than that. They are typically heavier than the corded versions because of the weight of the battery. Without taking brand names into consideration, these are some of the most common features that people look for in hardwood floor vacuum cleaners. They are all equally important, but there isn’t one single vacuum that is the best for everyone. Your home is different from your neighbor’s home when it comes to the layout, so you need to consider your specific situation when determining which features are most important. It can be easy to just pick the vacuum with the most features, but you will also probably be paying for more than what you need if you go that route.